I was on a dream vacation trip to India recently and it really got me thinking about hair. Anyone who doesn’t think hair is a relevant social and cultural discussion has obviously never had a bad haircut or an 80’s perm. At the risk of generalizing for all women (and men), I think we think about hair – a lot. We just have to remember the sensation caused by “The Rachel” of Friends/Jennifer Aniston fame or the more recent media coverage garnered by Jared Leto’s haircut for an upcoming role. Is it not a cultural phenomenon that in western society we even have the expression “Good Hair Day/Bad Hair Day”? The very idea that how your hair looks can make or break our day is an interesting concept. And in our industry, it’s certainly one that we can embrace! 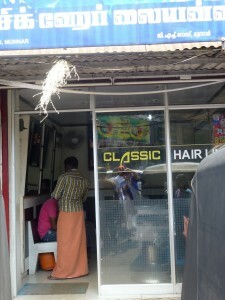 What had me thinking about hair while I was India was that I don’t think I saw a single woman there with short hair. I myself am a habitual “cut-it-short-grow-it-out again” girl, and I’m always wondering what to do next. I can tell you that India made me long for, – no – pine for, long locks once again. I wish to qualify my observations by saying that my travels were fairly limited to older, more traditional areas where the women of all ages were mostly dressed in saris, and with down-to-there hair usually worn in one fat, glorious braid down the middle of their backs, or rolled up into a neat chignon. And no bangs. It was beautiful, tidy and probably fairly low maintenance. It made me want hair like that – and now! But how long until I was bored again? I do love a nice set of highlights and a great blow-out. What do you think about your hair right now? Do you love it, or are you thinking about a change? Cut, colour, length, bangs or no bangs? Ooooh, maybe extensions? What’s next for you? Are you ever really and completely happy with it?